Welcome! *This website was updated* on 1 April, 2015. Click here for our new website of the REDD Research and Development Center, http://redd.ffpri.affrc.go.jp/ . The REDD Research and Development Center was launched within the Forestry and Forest Products Research Institute (FFPRI) as a comprehensive technological research hub on REDD+ of Japan on July 1, 2010. The REDD Research and Development Center is performing diverse activities such as research and technology development for REDD-plus, enhancing capacity-building in developing countries, cultivating experts who will support REDD-plus activities, and collecting and disseminating information on REDD-plus. The goal of the Center is to help build a society balancing sound forests and regional development, while conserving global environment through REDD-plus activities. Apr. 01, 2015 Website of the REDD Research and Development Center has been renewed. Mar. 05, 2015 Seminars and Workshops - Reports and documents is updated. Jan. 21, 2015 Seminars and Workshops - Schedule is updated. Dec. 05, 2014 International Seminar, "REDD+ Finance Mechanism and Its Optimum Use - How to incentivize forest conservation" is updated. Nov. 27, 2014 UNFCCC/COP20 Side Event,"A collboration platform for REDD+ express "Public-Private Platform": Japanese private companies are going on board" is updated. Nov. 15, 2014 Report of the side event at CBD/COP12 is updated. Jun. 03, 2014 COFO22/World Forest Week Event "REDD+ and Sustainable Forest Management" is updated. Apr. 15, 2014 Proceedings of the International Seminar: REDD+ Implementaion and Sustainable Forest Management are available. Feb. 14, 2014 REDD-plus COOKBOOK (Spanish version) (REDD-plus Libro de Recetas) is released. Feb. 14, 2014 Presentation materials of the International Seminar: REDD+ Implementation and Sustainable Forest Management are available. Jan. 24, 2014 International Seminar: REDD+ Implementaion and Sustainable Forest Management is updated. Nov. 17, 2013 FFPRI's side event at COP19 is updated. Nov. 07, 2013 Guidelines for Implementing REDD-plus is published. May. 27, 2013 Video program "Toward Implementation of REDD+: Climate Change and Forest Conservation" is available online. May. 16, 2013 Video program "Toward Implementation of REDD+: Climate Change and Forest Conservation" is updated. Feb. 20, 2013 Presentation materials of "Two-Day Seminar for Climate Change and Forests - Conservation of Tropical Forests Towards the Green Economy" are available. Jan. 09, 2013 REDD-plus COOKBOOK (Japanese version) is released. Dec. 04, 2012 Introduction to "Two-Day Seminar for Climate Change and Forests - Conservation of Tropical Forests Towards the Green Economy" is updated. 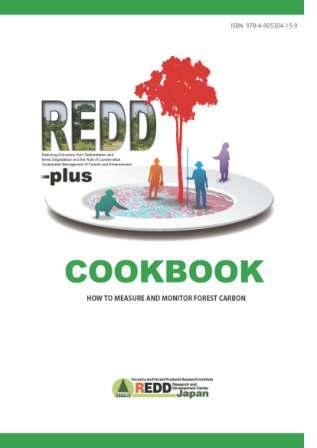 Nov. 26, 2012 REDD-plus COOKBOOK is released. Nov. 11, 2012 Introduction to the side event at COP18: What can national forest monitoring systems do? - Development of NFMS and MRV systems for REDD+ is updated. Jul. 27, 2012 Introduction to the side event at Bonn Climate Change Conference: Development of NFMS and MRV system for REDD+ - Learning from Demonstration Activities is updated. Jul. 24, 2012 Presentation materials of "Forest Day 5 Issues Marketplace (Forest carbon monitoring system at national and sub-national level for developing compliance scheme under bilateral cooperation and then UNFCCC)" are available. Feb. 28, 2012 Presentation materials of "International Technical Seminar Toward Developing a Framework of Global REDD+: Scaling up of demonstration activities and integrating players' roles" are available. Dec. 28, 2011 Introduction to "International Technical Seminar Toward Developing a Framework of Global REDD+: Scaling up of demonstration activities and integrating players' roles" is updated. Dec. 09, 2011 Introduction to "International Seminar on REDD+: Sharing lessons from voluntary projects, sub-national and national level activities for approaching global REDD-plus scheme" is updated. Feb. 24, 2011 Presentation materials of "International Technical Seminar on REDD+ - Knowledge Sharing and Discussion from Practices and Experiences" are available.